Things like dust, pollen, pet hair and dander, and fumes from smoking, cooking, cleaners, or even your furniture can accumulate inside your house and make your life miserable. You've probably experienced​ that yourself, or you wouldn't be here reading this. You want relief, and you want it now. Am I right? 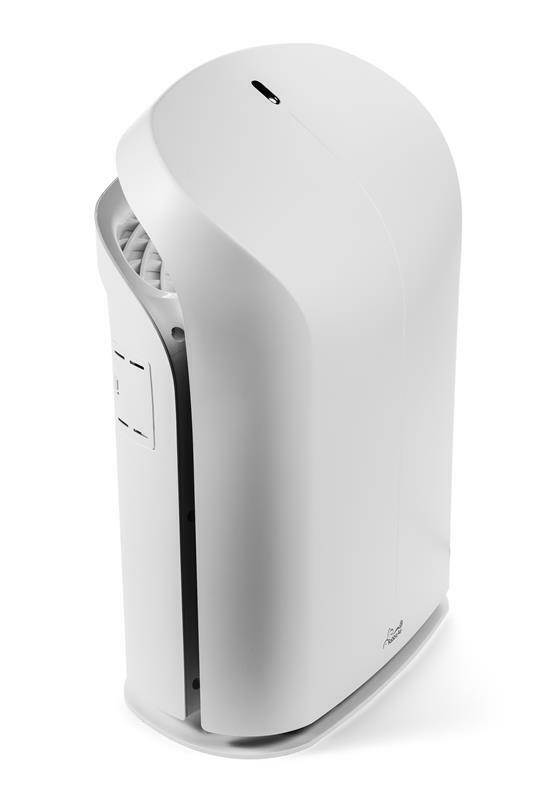 That's why you should check out the air purifiers made by Rabbit Air. One of them just might be the perfect solution to your indoor air quality problems. This review takes an in-depth look at the Rabbit Air BioGS 2.0 and MinusA2. They both come in two sizes, which is why you'll see four models in the comparison table below. After checking out that table, you can read more details about their individual features. We'll also talk about the price, warranty, and the pros and cons - everything you need to make an informed decision. ​In a hurry? You can skip to the part you're most interested in by clicking in the quick navigation below, or keep scrolling to read the whole review. What are the key features of the MinusA2? Does the MinusA2 emit ozone? How much area does the MinusA2 cover? What are the pros and cons of the MinusA2? What are the key features of the BioGS 2.0? Does the BioGS 2.0 emit ozone? Can you clean the filters? Does this help with tobacco smoke? How much area does the BioGS 2.0 cover? What are the pros and cons of the BioGS 2.0? Where can I buy Rabbit Air replacement filters? 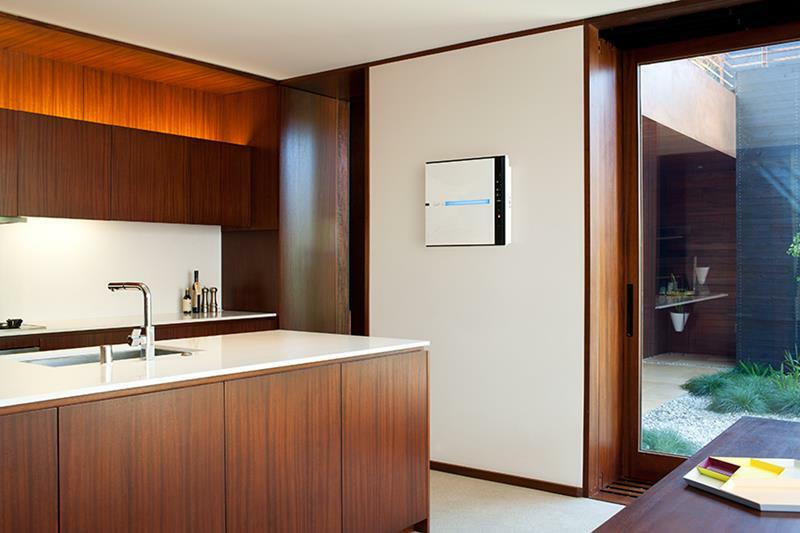 Are Rabbit Air purifiers Energy Star rated? What kind of warranty does Rabbit Air offer? Where can I get a good price on a Rabbit Air purifier? ¹ Zero with the negative ion generator turned off. On lowest speed, 0.002 ppm. Both figures should be compared to the California ozone concentration safety standard, which is 0.05 ppm. Both are significantly lower. You can set the MinusA2 on the floor or on a piece of furniture. It blends right in! The MinusA2 is more expensive than the BioGS, but then it has more bells and whistles. It covers a larger area, too. It's great for allergy and asthma sufferers. In fact, it made the list of the Asthma and Allergy Foundation of America's certified "asthma and allergy friendly" products. 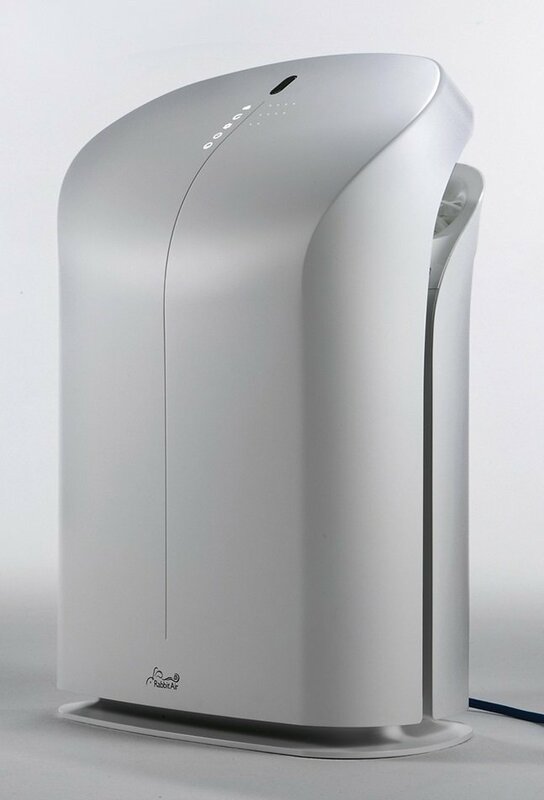 Plus, according to Cigar Aficiando magazine, it's one of the best air purifiers for smokers. ​One thing you'll notice right off the bat is the sleek modern design of the MinusA2. It looks like a small LCD TV, and it's about the size of a chessboard. There are two color choices: black or white. You can let it stand on its own, or you can mount it on the wall. Mounting the MinusA2 on the wall keeps it out of the way. No need to give up your precious floor space! Pre-filter - traps the largest particles like hair and lint. This protects and extends the life of the other filters. Medium Filter - traps particles larger than 1 micron, such as pet dander, pollen and mold. BioGS HEPA Filter - traps 99.97% of particles as small as 0.3 microns. Unlike regular true HEPA filters, it also reduces the allergens and bacteria that it has trapped. So you don't have to replace it as often, and that saves you money! Activated Carbon Filter - high grade granular activated carbo﻿n (GAC) reduces chemicals (VOCs) and other odors. Negative Ion Generator - sends negatively charged oxygen atoms (negative ions) out into the air. The ions attract and weigh down particles in the air, making it easier for the filter to trap them. Germ Defense - traps and reduces bacteria, viruses, and mold. Great for those with weak immune systems, the elderly, and kids. Toxin Absorber - specially designed to trap and reduce VOCs (gases from certain solids or liquids). Good choice if you're in a new home or doing renovations, or wherever you have strong chemical fumes. Pet Allergy - reduces pet allergens and dander. Odor Remover - rids the air of odors from smoking, cooking, fireplaces, mildew and pets. You'll have to pick from one of the four filters when you buy the system. But you can always change it out for a different kind if your needs change. Rabbit Air uses an advanced brushless motor that's both energy efficient and quiet. On the lowest speed, it's virtually silent. ​The display and control panel are right on the front of the unit - easy to see and simple to use with just a touch of a button. It also comes with a remote control that you can use to change the settings. You get 5 speeds to choose from, ranging from "silent" to "turbo". ​There are also two modes to pick from: Auto or Pollen. 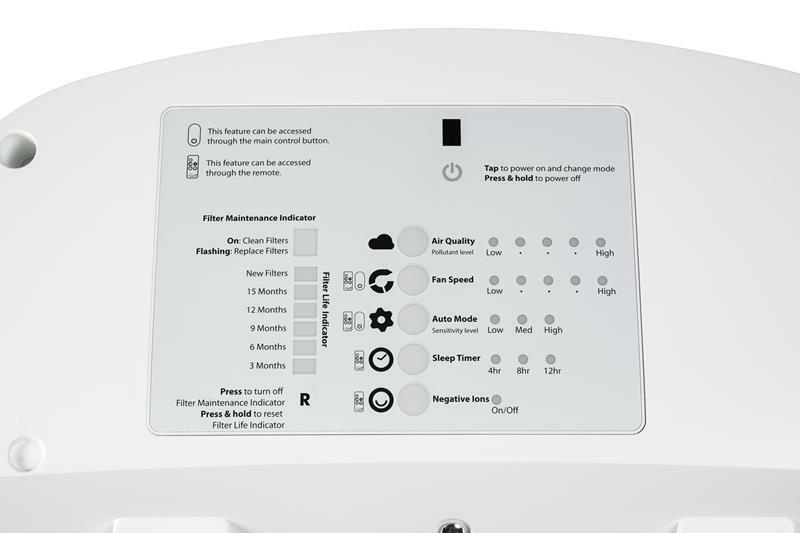 Auto adjusts the fan speed according to the light and air quality sensors. 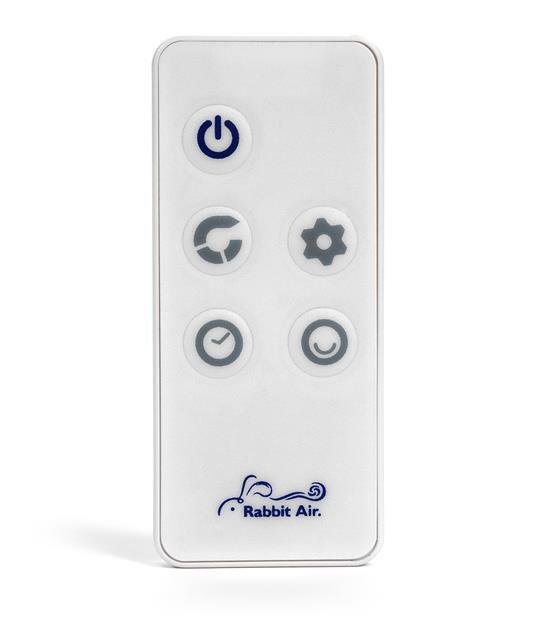 It goes into sleep mode when the room gets dark, so it won't run on high and disturb your sleep. And when the sensors detect odors or particles in the air, the fan speeds up until the air is clean. 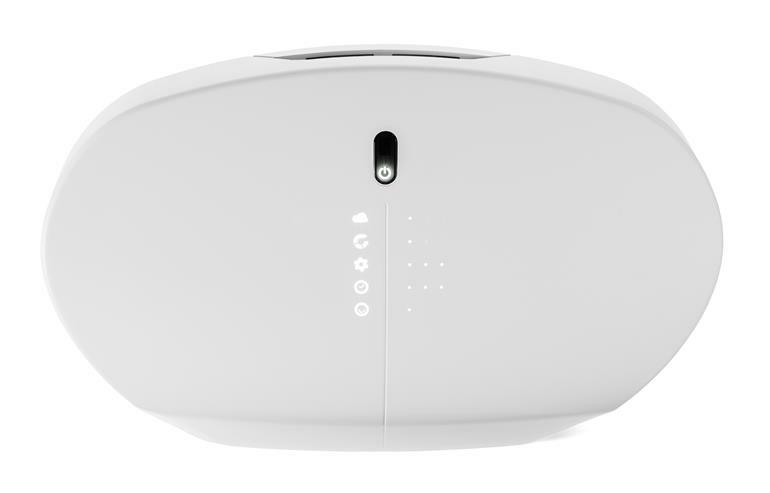 Pollen mode ignores the light sensor and adjusts the fan speed based only on air quality. An air quality indicator light on the panel changes color to show you the condition of the air. When the air is clean, the light is blue. But when the sensors pick up some kind of pollutant, the light will change from blue to purple to red, and the fan will speed up. When it's time to replace the filters, a filter replacement indicator on the panel lights up. So you don't have to write it down or try to remember when you changed them last. It doesn't emit any ozone when the negative ion generator is turned off. When it's turned on low, it emits 0.002 ppm, which is far less than the 0.05 ppm maximum safe ozone concentration standard set by the California Air Resources Board. And in case you didn't know, California has the strictest environmental standards in the country. The pre-filter can be vacuumed and then washed with warm water, if necessary. Keeping the pre-filter clean will prolong the life of the other filters, which are not cleanable. Here's where the two MinusA2 models differ the most. 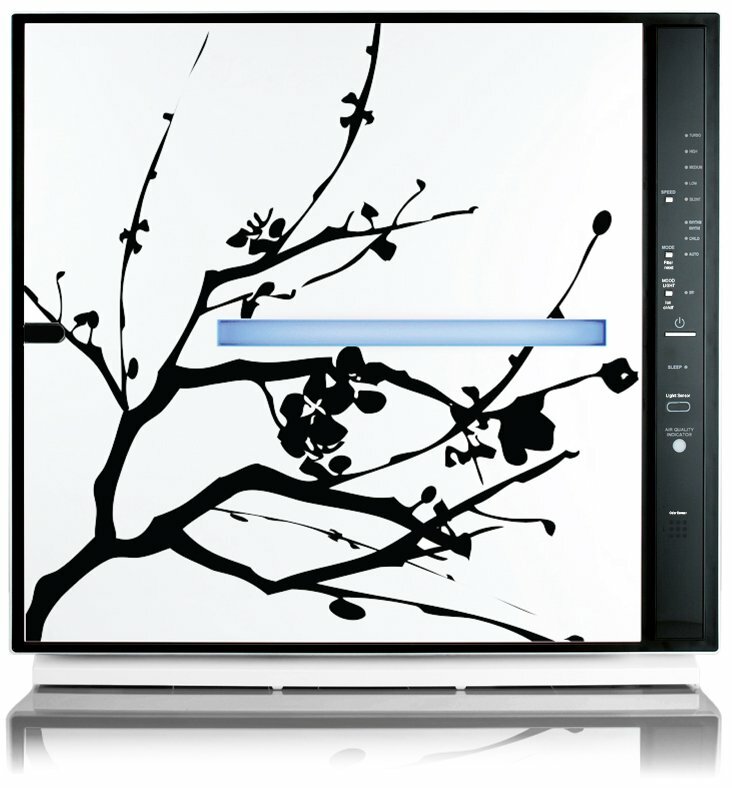 For normal use, the Model SPA-700A can cover up to 700 square feet. That's with 2 air changes per hour. At a higher speed (with 4 air changes per hour) it covers up to 275 square feet.​ If you have a big problem with allergies, you may need to run it at this higher speed. Click here to ﻿see the current price and any available discounts for the MinusA2 at Amazon. The BioGS 2.0 is perfect for bedrooms. This is the second iteration of the popular Rabbit Air BioGS, hence the "2.0". It's not customizable like the MinusA2, and it uses a 4-stage filter process instead of 6. Still, the BioGS 2.0 does an exceptional job of reducing allergens in the air, and it's quiet. ​This newer version of the BioGS doesn't look anything like the old one. It's sleek, modern, and curvy - much more pleasing to the eye. If you like minimalist design, you'll love this! Whatever your decor, it will fit right in. Notably, the BioGS 2.0 won both the Good Design Award and Red Dot Design Award in 2014. That's quite an achievement! The Rabbit Air BioGS 2.0 is designed for superior air flow and ease of use. Pre-filter - traps big particles of dust, hair, dirt and lint. BioGS HEPA filter - traps and reduces 99.97% of allergens down to a size of 0.3 microns. Granular Activated Carbon (GAC) filter - reduces odors and VOCs. Negative Ion Generator - boosts the efficiency of the filters and makes the air fresher. This feature can be switched off. So you can see that it's similar to the MinusA2, without the medium filter and extra custom filter. ​The BioGS has one of the most simple user control interfaces that I've ever seen on an air purifier. There's only one button for changing the settings. You just push to scroll through to the speed or mode you want. Then when you stop, it kicks into that setting. You can also use the remote control to change the settings. That's a little bit faster. When you adjust the settings, the display lights come on. But then the lights fade out after a few minutes of being idle. Only the power on button stays lit all the time. On auto, the sensors detect the level of pollutants in the air and adjust the fan speed. You can select low, medium or high sensor sensitivity to suit the conditions in the room. Lights on the display show the air quality level and fan speed. So when it's on auto and the level changes, it will light up. This can be annoying at night, so some people turn off auto and use a manual speed setting when they go to bed. You can also set a timer so it will run for 4, 8 or 12 hours before shutting off. It can only be accessed from the remote control. The Ion Generator on/off switch is also only on the remote, not the unit itself. Since a couple of functions only work with the remote control, you don't want to lose it. Fortunately, there's a slot built in to the top of the unit where you can keep it. One last display to mention is the filter life indicator. It tells you when it's time to clean the filters and when it's time to replace them. You have to take the front cover off to see the indicators. That's easy enough to do, but you need to remember to check it every now and then. BioGS 2.0 display and control panel. Filter life indicator is on the left. 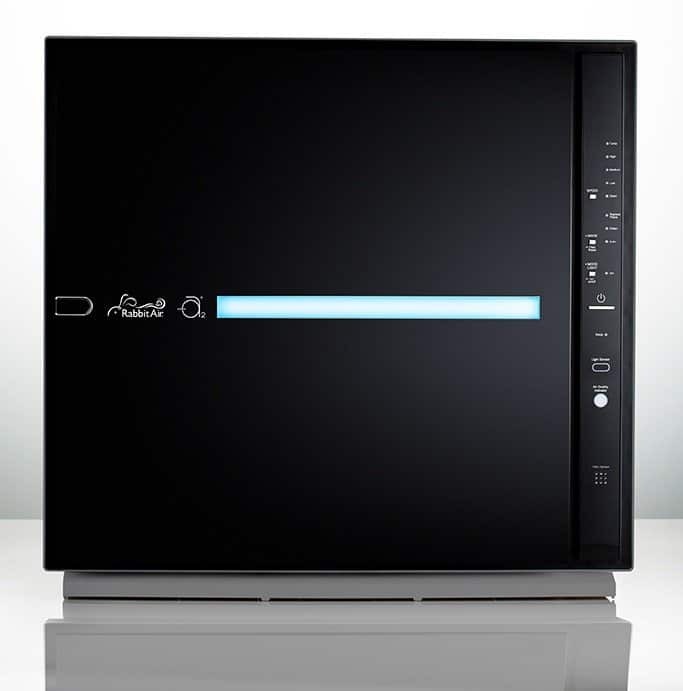 ​All Rabbit Air purifiers use a high quality brushless motor that allows for super quiet and energy efficient operation. It's really great for sleeping! ​You can clean all three filters by vacuuming. The pre-filter is washable, so if it's still dirty after vacuuming, you can rinse it with plain cool water. The charcoal filter and HEPA filter are not washable, and they'll need to be replaced about every 18 months. If you smoke or have pets or create a lot of heavy cooking odors, you'll probably have to replace them more often. It will help with smoking odors and chemicals, but the MinusA2 is more effective for smoke. One way to tell that is by comparing the CADR of the two models. BioGS 2.0 is 152 for smoke; MinusA2 is 193. The Model SPA-550A covers up to 550 square feet, with two complete air changes per hour. 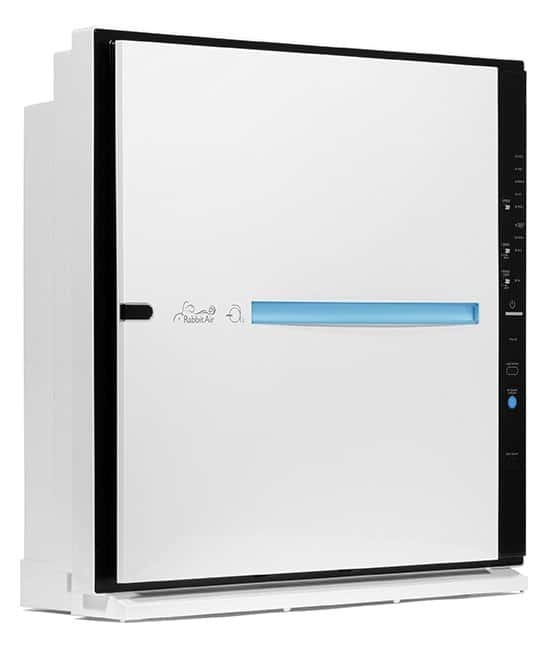 If you suffer from allergies or asthma, Rabbit Air recommends running the unit at a higher speed so that you get 4 air changes per hour. At that rate, the coverage area will decrease to 275 square feet. That's about equal to a medium size master bedroom or family room. To cover a larger area, you could go with the Model SPA-625A. It can filter up to 625 square feet with 2 air changes per hour or 313 square feet with 4 air changes per hour. Click here to ﻿see the current price and any available discounts for the BioGS 2.0 at Amazon. You can buy replacement filters for MinusA2 and BioGS 2.0 air purifiers directly from Rabbit Air. Or, check for availability and the current price at Amazon by clicking here. Yes, all four models are Energy Star certified. That means savings on your energy bill. 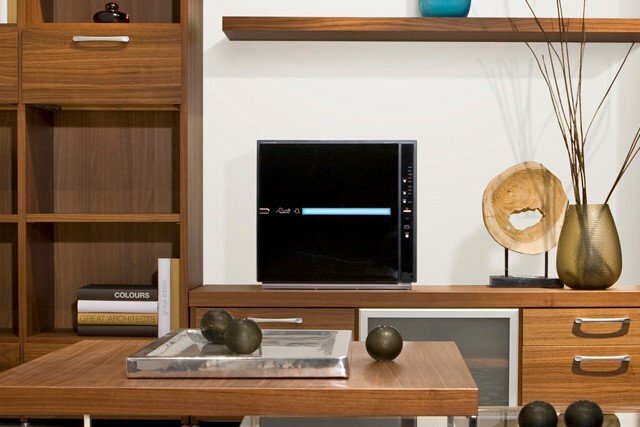 Rabbit Air purifiers are covered by a 5-year warranty plus a 90-day full replacement guarantee. If you find your unit to be defective in the first 90 days after purchasing it, they will replace it for free and reimburse you for the shipping. I looked around and found several online retailers, including the manufacturer. But I recommend Amazon because it's a well-known and trusted company with great customer service and quick shipping. Returns are quick and easy with Amazon, too. Okay, that was a lot of information. Let me summarize it for you. The biggest difference between the MinusA2 and BioGS 2.0 models​ is that the MinusA2 has two more filters than the BioGS. That makes it the more effective of the two, no question. 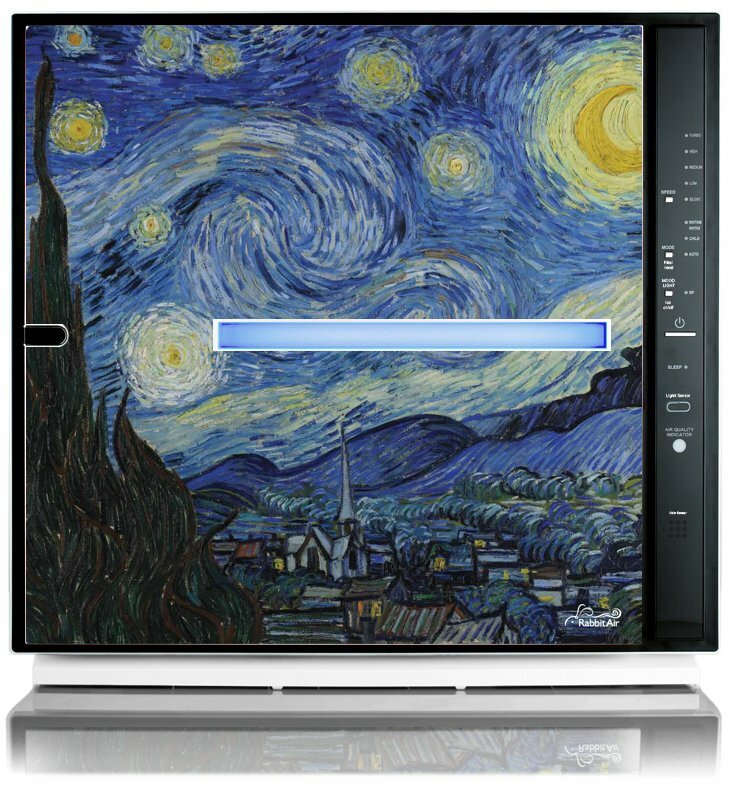 ​Besides that, the MinusA2 can be customized, and it can be mounted on the wall. Neither are true of the BioGS. Both models are great for allergen and odor reduction, but the MinusA2 is a little bit better for smoke.​ And they both have quiet motors and ion generators. The biggest negative for both is the high price. They're not cheap, and they might not fit into your budget. But, like most things, you get what you pay for. And if you think of it as an investment in your health, or your family's health, it makes the higher price a little easier to swallow. ​From what I've heard and read, the Rabbit Air customer support is excellent. And the 5-year warranty and 90-day replacement guarantee shows that they stand behind their products. So if this sounds good to you, get a Rabbit Air for yourself today! To check for availability and the current price at Amazon, click here for the MinusA2 or here for the BioGS 2.0. 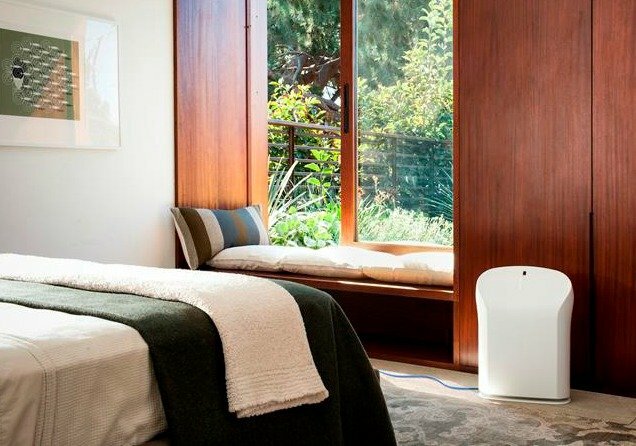 ​If you're still not sure, and you'd like to check out some other quality air purifiers at different price points, please see my review, Best HEPA Air Purifiers for Home and Office.